Upper part of Kaponier fortress, military hospital and museum complex. The Kosoi Kaponier was built in 1844 as part of the Novaya Pechorskaya Fortress. Model in museum director's office of planned reconstruction of Kaponier fortress. It was used as an armory and then as a political prison. The excellent displays recount this history. Part of map showing Kiev defensive works in 18-19th centuries. Model of the kaponier in the office of the museum director. There is also a fine display of military miniatures in the new museum. View down onto roof of kaponier. View of back wall and entrance being restored. View of side of the kaponier, shows embrasures for cannon. View of side and top from above the kaponier. This kind of fortress structure came from Italy. It was placed cross wise in the fortress ditch so that its cannon would sweep the ditch in case any attackers lodged there. Entrance and back wall being restored. Micha in Kaponier looking at model of the fortress. Models in uniform with cannon - 19th century in Kaponier. In ditch of the Kaponier fortress. Outside rampart of 18th century fortress protecting south side of Kiev and Pechora monastery, with city gate. More views of the rampart are with the photos of the memorial and museum. The rampart dates from 1698-1701 fortification program of Mazeppa and Peter I against Ottoman or Swedish invasion. Ceremonial (Moscow) city gate in rampart wall of Pechora fortress on south side of Kiev, gate from 1740's. 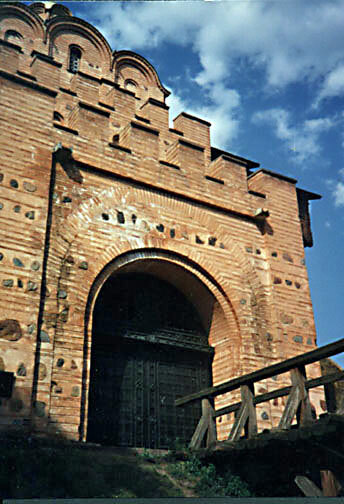 The Great Gate of Kiev, (1037) built by Yaroslav the Wise as part of major expansion of city fortifications, reconstructed in 1982. View of the gate from another angle. The original was destroyed during Mongol attack in 1240. Another view of the Great Gate. The restoration architects were Ye. Lopushinska, M. Kholostenko, and S. Vysotsky . Monument to Princess Olga, Sts. Cyril and Methodius and the Apostle Andrew the First Called, Sculptor - I. Kavaleridze in 1911. Statue of Grand Prince St. Vladimir by Dnieper near location where he had the population baptized. Detail of Cathedral of St. Vladimir (1862-96), by architect I. V. Shtrom. Detail of Cathedral of St. Vladimir. Statue of Yaroslav the Wise next to the Great Gate showing him holding a model of St Sophia cathedral. .A statue of one of the great Hetmen of Ukraine, Petro-Conashevich Sahaydachniy. View from hill next to State Historical Museum over the Podol section - ancient trading suburb. View from hill by State Historical museum - the fanciful building in forground is the Castle of Richard the Lion Hearted, 19th century. The opera house, named for Shevchenko, built 1899-1901 by architect, V. O. Shreter and scene of the assassination of Minister Stolipin. Kiev city train station. Railroads are the best functioning systems in all former USSR republics. Facade of the Kyiv University, named for Shevchenko, (1837-43), by architect V. I . Beretti - painted red on order of Tsar Nicholas I, after student riots. Mariyinski Palace (1750-55) based on design by Rastrelli for Tsarina Elizabeth, now houses offices and guests of the Supreme Rada, which meets next door. Typical decoration in subway station. This shows Grand Prince Yaroslav Vladomirovich (the Wise). St Andrew church (1746-61) designed by Rastrelli. St Andrew church, located on hill overlooking Podol and river, traditional spot where St Andrew placed a cross. St Andrew church, another view. Cathedral of St Sophia, (1017-31) Blessed Wisdom, built in honor of Yaroslav's victory over the Pechenegs on this spot, then outside the city, this view shows upper part, domes, late 17th century Ukrainian Baroque. Yaroslav's tomb in inside. Cathedral of St Sophia view of upper domes and roof, some of interior retains 11th century original frescos and mosaics, but exterior is much altered. Original section is modeled after Hagia Sophia's in Constantinople. Inside is iconostasis of 1754. Entrance gate bell tower - the cathedral was heavily damaged during the Mongol attack and again during Polish occupation. Entrance tower - 76 meters high - 1744-52. The cathedral was abandoned until 1685 - 1707, when Mazeppa and Peter I undertook repairs. And Peter celebrated Poltava victory here in 1709. View of entrance tower - Ukrainian Baroque decorations. Side view of part of Cathedral. View of top showing multiple Ukrainian Baroque domes. The State Historical Museum of Ukraine, located on the hill on which the oldest kremlin of the city was located. The foundations are reconstructed to show the Desyatynna Cathedral, founded in 989. Typical older section of town near the Golden Gates. This Kenasa building of 1900 is on Yaroslavski Val. Statue of Boghdan Khlemenitski in square. (1888) Sculptor - M. I. Mikeshin, Architect - V.M. 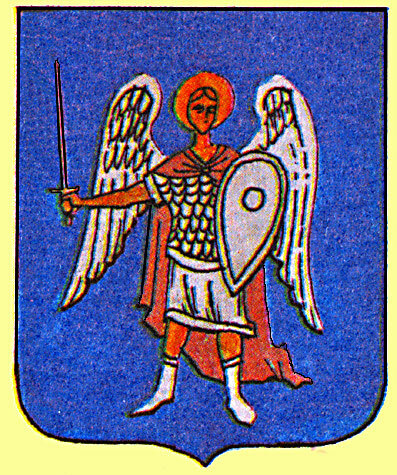 Nikolaev. Crowds celebrating Ukraine Independence day downtown. Typical temporary kiosk for holiday sales. Crowd enjoying Ukrainian Independence day in Kyiv in Square of the Revolution. Crowd inside MacDonald's for holiday. Crowd outside MacDonald's on popular holiday . Pechora (caves) Monastery, On left is Bell Tower of the Further Caves, 1761, on right is Church of Nativity of the Virgin, 1696, view from top of fortress rampart outside monastery. Entrance to Pechora Monastery, Trinity over-the-gate church, 1108. The monastery was founded in 1051 by monks, Antony and Theodosius, 4 km south of city. Side view of the Trinity over-the-gate Church at main entrance to Pechora Monastery, interior has frescos from 18th century. Large domed Refectory Church of St Anthony and Theodosius, 1885-1905, restored in 1956. Cathedral of the Dormition of the Virgin, (Uspenski) (1073-1089) destroyed during World War II by Communists who blamed Germans. To right is refectory and Church of St Anthony and Theodosius. View south and east over river and south part of monastery, on hill of southern caves are (rt to lft) Bell tower of the Further caves, Church of the Nativity of the Virgin, Church of the Conception of St Anne and Entrance to the Further Caves. Closer and much lower is Church of the Raising of the Cross next to the entrance to the lower caves and its Bell tower to the right. Bell tower of the Near Caves, 1754-1763, architects - S. Kovnir and S. Italyanets. Church of St Theodosius (17th century) across street from entrance to Pechora Monastery. Church of our Savior in Beechwood, (Spas na Berestove), founded by Vladimir Monomach as location of the tombs of the grand princes, Ironically it has the tomb of Yuri Dolgoruki, who sacked Kiev and moved the grand princedom to Vladimir. Church of our Savior (Redeemer) in Birchwood . View south over river and further caves in monastery, close in left are Church of Raising of the Cross and Bell Tower of Nearer Caves in right, on hill are Bell tower of Further Caves, Church of the Nativity of the Virgin and Church of the Conception of St Anne. Ukrainian Baroque painting in Trinity Church . Painting in Trinity over-the-gate church . All Saint's Church over the northern (service) entrance. 17th century, architect - Aksamitov. All Saint's Church, over northern gate, interior dome Fresco of Savior. Dome, All Saint's Church, Fresco of Savior . Refectory church - sales stand. Fresco on wall, All Saints Church. Ceiling in All Saint's Church. Tomb of Yuri Dolgoruki, Grand Prince, prince of Suzdal-Vladimir, who sacked Kyiv and founded Moscow. It is in Church of our Savior at Berestovo. Museum of Ukrainian architecture - Church from Carpathians. School house from Poltava region. Church from Poleyse region, same as view 11. Church from Carpathian mtn area. For a brief history of Kyiv please go here.. Please jump here for history of the Kievan Pechersky Monastery. For photos of the military equipment at the museum between the fortress wall and World war II memorial please go tomuseum. For information on future trips we are planning to Ukraine please contact Xenophon. For comprehensive assistance with travel throughout Ukraine please contact Ms. Riazantseva. at Ukrintour in Kyiv.